Home » Is wrong information being given out at Glassdoor? I think the second “is” is a typo. Right you are (were)! I fixed it. Thanks! Sometimes I edit and proof so hard that I miss a big one! No, I’m pretty sure the first “is” and the question mark were typos. @Peter: You figured out what the original title of the article was, Bro. The second “is” was an artifact of editing the original. Maybe it’s the first “is” that shouldn’t be there—along with the question mark. When I tried posting a negative review of an interview experience, boom! An internal error has occurred. Wouldn’t you know it, Glassdoor runs paid job ads for the same company. Conflicts pervade all “review” sites. TripAdvisor makes money selling hotel rooms. That TripAdvisor sticker on the front door of the property? I bet it would still be there if the health dept. closed the place for bedbugs. And don’t get me started on Yelp. There is a catch in all of this, as I’m sure readers have noticed: this fake-review campaign doesn’t mention how these companies are hiding all of the NEGATIVE reviews. If there are a ton of negative reviews (all sounding similar, written at various times and by various people) all blasting the company for being negative, and then these mysterious five star reviews pop up, they’re more likely to be interpreted as put there by the company and give even MORE credibility to the bad reviews, especially in light of the fact, as I’ve seen myself some reviews that sounded like PR rear-smooching to me, that they are often just praise with little insight into why and often put a very suspiciously low amount in the area of what could be improved in the company. The only way these five star reviews would possibly work is if they came soon after a negative trend began (i.e dropping from 4.3 to 3.4) or something, not when things drop from 4.3 to 2.5 over a period of time. At least corporate PR people haven’t figured out how to REALLY damage the negative review rating: by having employers put bad reviews for COMPETITOR companies, thus making all bad reviews suspect in time as competing companies reciprocated the bad reviews back at them. I think that it’s a given that the bad reviews (the more-likely-to-be real ones anyway) are given more validity than the positive reviews in any case, even before this story broke. I guess, to sum up my post above, we have proof that Glassdoor is ALLOWING WRONG information to be posted. Do we have any evidence that it is BLOCKING TRUE information from being posted or removing it (perhaps due to a payoff from the company being reviewed) if it is posted? If they aren’t, then the true information may tell the real story in spite of the fake information, and may in fact, be able to make it obvious that the fake information is fake and further show that it’s a bad company to work for. Does that mean a 5-star review that the company (the “paying customer”) pressured an employee to post on Glassdoor? Is that false advertising? The WSJ’s report raises a lot of questions. If you’re going to dig into this, also look up the Lanham Act and the Federal Trade Commission Act, which holds that “unfair or deceptive acts or practices in or affecting commerce” are illegal. I review employee comments and salaries on Glassdoor. However, when I see glowing five-star ratings and no cons, I suspect it was written by HR. Now I know they are bribing/coercing employees to post upbeat reviews about the company too. If job seekers knew more about this practice, I wonder how Glassdoor would do. 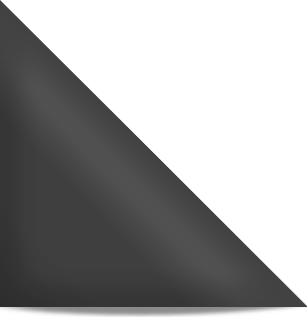 Negative postings – likely accurate unless obviously spiteful. Great story! I have always viewed info on Glassdoor with a measure of suspicion and hadn’t heard about the WSJ article until I read your story about it. Thanks for confirming my suspicions!! I can answer the question in the title with two words: Well, d’UH! I learned when my bad review of Fidelity was automatically deleted that companies could pay a little extra for an upgraded package that, in addition to doing what you’ve mentioned, also deletes negative comments. Hence wealthier companies like Fido have stellar ratings, while smaller companies who can’t afford the fee will be “outed” by other employees, like this place, https://www.glassdoor.com/Reviews/C-4-Analytics-Reviews-E676606.htm?sort.sortType=RD&sort.ascending=false. I’ve wondered for years whether GD will start censoring the interview reviews as well (lordie knows I’ve left enough to write a book), I’m guessing the reason they haven’t yet is because it’s the only thing that keeps GD looking somewhat legitimate. @Sigh: I’ve read excerpts from Lyons’ book in a magazine or two. Interesting stuff! Well, I’m not sure what’s soo shocking here? Don’t we all know about ‘fake news’ by now? My feeling is, Companies such as Glassdoor, Yelp, TripAdvisor, even google who offer some insight/feedback/reviews….are all going to be ‘manipulated’ to agree. However, I still use w/logic. A TON of negative reviews vs positive….to take with a grain. There’s some ‘reason’ for that. 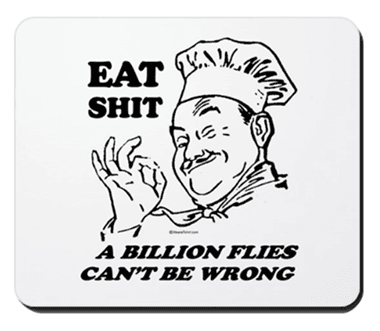 For those w/ Very few reviews….either all negative or positive…well, we probably shouldn’t put much stock into. 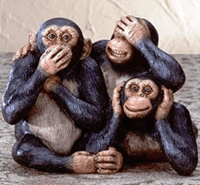 So Nick, what do you suggest (with what we have available today) Sites to go to if want some ‘insider’ info….if we don’t have ‘inside’ info about Companies we seek to review? You think ALL out there (including Glassdoor) are completely worthless? I’m not picking on you. :-) You’re just the first to come out and say it, so I’ll take the opportunity to repeat what I’ve said in other columns about Glassdoor’s salary “data” and company reviews. I raised this issue in this column. People rationalize illogical conclusions. If we know reviews are anonymous, we know there’s no accountability. 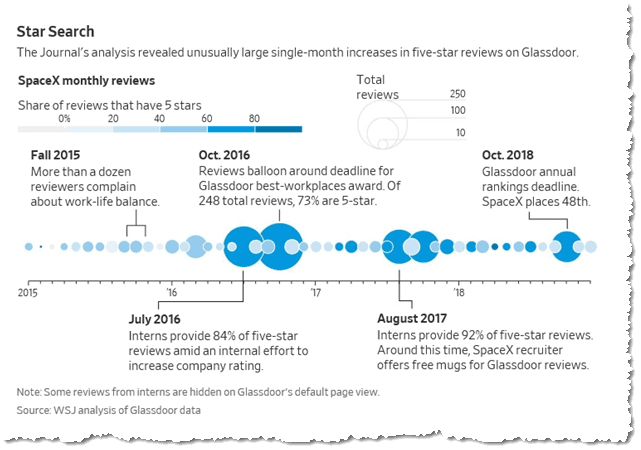 It’s also clear from experience that lots of reviews on Glassdoor are fake — some stick out like sore thumbs! So, if all are anonymous and thus unaccountable, and some are obviously fake, how can you logically trust ANY “n-th” review? The answer is — logically — that you cannot. Thus, you cannot trust ANY review on Glassdoor. And the whole thing falls apart. The other fallacy has to do with quantity. Why are high quantities of positive or negative reviews more or less worth believing? “There’s some ‘reason’ for that.” No, there’s not, and even if there were some “reason,” you would not know for which ones or what the reason is. The fundamental problem is that people who try to use Glassdoor reviews really, really want information they can use. Thus they approach the site with an unreasonable BIAS. They WANT to believe because they NEED the information. I get that. But needing something doesn’t validate it. Don’t let my answer shock you, because it’s very obvious. Invest the time and effort to identify and talk with people who actually know the company in question. There’s no trick, no shortcut. Discuss with them one on one. Ask questions. When you get answers, ask follow-up questions. This is called reasoned research. The main reason this is better than ANY website is that you not only get information; you get to assess all the other cues that let you JUDGE THE SOURCE. Does the person SOUND knowledgeable? Are they consistent in what they say? Do they seem to have a grudge, or do they seem to have a healthy, balanced view of the company? See where I’m going with this? Valid references — on people or employers — are WORTH A LOT. They don’t come cheap, easy or free. And they’re not posted on some website. (HINT: THIS IS WHY GLASSDOOR IS A WORTHLESS SERVICE IN MY OPINION. It costs you nothing.) You have to do the work to get valid, reliable data because you must obtain it in a way that enables you to JUDGE it based on many other factors. If I’m going to invest a lot in someone or something or some company, I’m going to invest seriously in due diligence. Everything else is, well, crap. > If we know reviews are anonymous, we know there’s no accountability. I don’t think it’s quite so pat, as my experience with my former workplace might illustrate. It was a dysfunctional workplace that spiraled down into sheer toxicity when the HR department and leadership tried to implement a grass roots culture change as a way to improve employee engagement. The largest part of the dysfunction came from the management style of one director, and the managers who reported to him passed the dysfunction down the chain either because they emulated his awful management style or they were busy with CYA behaviors. Around this stage, I (and some others) submitted Glassdoor reviews about the issues. I tried to explain unemotionally what the problems were and gave constructive suggestions for improving things. The HR team replied to the reviews with only a commiserating tone and invited us to contact them directly. As trust was rock bottom and I knew that my managers would retaliate, I never did that and hoped they’d take my GD review as I intended it. They apparently disregarded it. The following engagement survey showed even worse results in that one division, so they then implemented a anonymous 360-degree feedback for the managers. I’m not sure why HR thought that was the solution, but they’re known for being very Mary Poppins. It did throw fuel on the fire, as just after I left the company, I heard from my non-managerial former coworkers that many of them were getting PIP’s filed against them. (performance improvement plan, generally used as documentation prior to termination) Clearly the managers were retaliating for the 360-degree feedback they got. Own judgements…real interactions…personally accountable. Everything else is BS. Oldest rule in journalism applies here: follow the money. 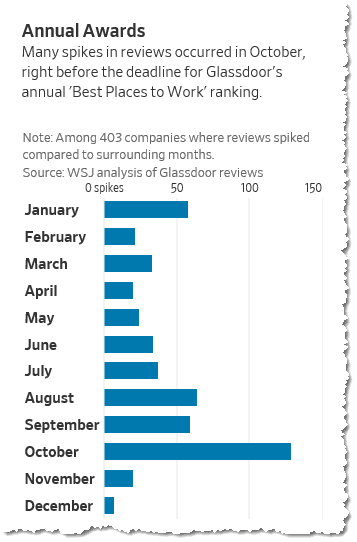 Who pays Glassdoor? Who pays LinkedIn? Not us worker bees. Once more, thanks for a great column. I worked at Zander Insurance. The company is pushed by Dave Ramsey who in turn uses Jesus to push his agenda. That guy has made millions and made Zander Insurance millions by using religion to sell and not on a Sunday! Regarding Glassdoor reviews, Zander Insurance uses internal employees to spruce up their company reviews. The company has done better with culture but it is far from being a 10-best places to work in Nashville or Tennessee. The company has a greed problem that holds back its true potential. Same problem at Dave Ramsey’s business. Messed up! Thank you Nick! A certain ex-employer of mine, a daycare owner in Seattle, does this. She has yes-men (and women) who post five-star reviews on Yelp, Indeed, and Glassdoor to try to offset the many bad ones left by dissatisfied parents and ex-employees who know the truth: It’s a horrible place to work. The owner’s management style includes various forms of bullying, including blaming her own shortcomings on employees’ incompetence, bad attitude, or bad character; threats and intimidation, including threats of termination if a current employee says ANYTHING negative about her or the company; and gaslighting. I was there only 16 months, and in that time, out of a staff of 30, 11 quit with little to no notice. 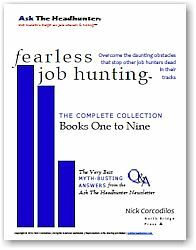 Of the 11, 2 gave two weeks’ notice, but did not stay the full two weeks; 2 gave only one week’s notice; 3, including me, left work at the end of a shift and never came back; and 4–yes, I said FOUR–walked off the job in the middle of a shift. Of the 3 who left at the end of a shift and never returned, 2, including me, gave physical or mental health-related reasons as the main reason for leaving. Of the 4 who walked off the job, 2 did so for physical or mental health reasons. The daycare offers organic food to the children and gym memberships as an employee perk, and claims to promote health and wellness. But the numbers above tell a completely different story: of unhappy employees whose physical and mental health is being severely damaged by work stress, and a business owner who cannot be trusted to tell the truth or keep her word. I love the ‘Not us!’ disclaimer, I remember the Eat Sh#t posters, and I remember, Nick, when you became so disillusioned with LI. Perhaps part of the problem is that the younger, Internet-raised generations don’t understand they need to learn real-world personal and interpersonal skills and to trust their guts instead of automatically believing what they’re told electronically. As for the reviews themselves, I rarely post any kind, and then only if I can do so honestly with the intention of either rewarding or training. I’m always, always cognizant of my words living in the ether. And when I taught high school, my students learned the hard way that averaging a 100 and a 0 came to only 50, which wasn’t easy to raise back up to a passing grade. I worked briefly for Akima, the government contractor which later became best known for firing an employee for giving the finger to Trump while on her own time. While I knew that the company did not have a great reputation, I was suckered and lied to when they hired me and desperate for job with benefits. It was a horrible place to work. The only employees who seemed happy were those rewarded for kissing the boss’s rear. I wrote negative reviews on Glassdoor and Indeed but they were both deleted around the same time most other bad reviews disappeared and a number of glowing reviews appeared. Some even wrote positive things about management and the CEO. Shortly before I left, the HR Dept. hired someone to be an image doctor for hiring so my guess is that they paid off Glassdoor, Indeed and who knows what else. Hi everyone. I am having trouble with this. Is anyone really that gullible to trust this type of site with their career choices solely, or even partially with out checking further about a company? What type of individual makes decisions according to data that can be easily corrupted or manipulated? @Tony: Who believes and relies on such “data” is one thing. The fact that Glassdoor operates as it does with apparent impunity, and the fact that thousands of companies spend money on it is another — I’d argue bigger — thing. The impact on employment and the economy is yet another thing. To extend your question, What type of employer makes decisions and spends money to be a part of this? 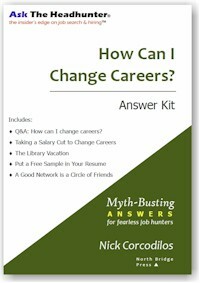 Unfortunately people do, including those new to searching for jobs. My daughter and her boyfriend are both in college and searching for work. They’ve applied to multiple jobs through Indeed and have not received one response. They’ve had similar problems trying to find an apartment and other work through Craigslist – scams galore. They are both young and trusted what was being posted, but became suspicious after some of the offers were too good to be true. Both now realize it’s best to use those sites as fishing expeditions, then go to companies offering the jobs in person, finding out how to apply for the jobs, if they are available, and doing their own research. It’s been a frustrating and time consuming process. Both are now interviewing with a legitimate company connected to their college after I did some initial research online and found positions not posted on job boards. I receive several emails from Glassdoor daily. I started wondering about the quality of the information I was getting from them some time ago. Not necessarily about the company ratings, though. 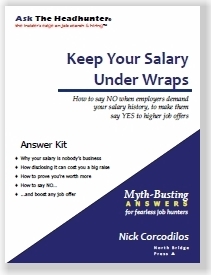 My questions were about the so-called “High Paying” text that would accompany many of the job listings. After the company and CEO rankings (which I don’t pay much attention to, anyway) and the wild salary estimates, by biggest beef with their business model is their sending emails full of job for which I’d be a poor candidate. Heck, if *I* were a hiring manager I’d never consider me for many of the ads that Glassdoor seems to thing I’m ideal for. I can imagine that others tire of reading through the listings that a good recruiter would know not to contact you about. I work somewhere currently where a negative review was deleted. I didn’t know employers could pay to alter or delete reviews!! Shocking….negative reviews removed! I didn’t know employers could pay to delete negative reviews or to edit them either. I don’t use Glassdoor as I’d rather do my own research and preferably get intel about employers from current or former employees. This way, I know the source and can better judge the intel (I hope). Reviews aren’t perfect; I see reviews as opinions; everybody has them, and people can agree to disagree on the product or employers reviewed. But what I find despicable are employers who only want glowing, five star reviews and who don’t see anything wrong with getting rid of anything negative or changing a so-so review to a positive review. It isn’t just Glassdoor. A few years ago I bought an item online and was so disappointed in the product that I returned it. The company had really gone downhill, and I posted a negative comment online about it. My comment appeared briefly (maybe a day or two, tops), then was removed. Why? I had noticed a few others commented as I did, and their negative reviews were also removed. Note to company: instead of sweeping the negative reviews under the rug, why not contact those who gave poor reviews and find out more, then take a good, honest look at the merits of the negative reviews to see if those people were justified. If so, then fix the product! The same goes for Glassdoor. 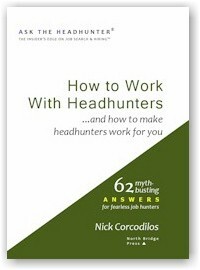 Any job hunter with a brain should be suspicious of all of the positive reviews. If Glassdoor really wanted to do what they say they want to do, then leave up the negative reviews. Even the best of companies know there is always room for improvement, and if all you get are glowing reports, then the problems never get fixed. The emperor’s new clothes indeed. I have a bit of a different take as to why some companies encourage employees to give them great reviews on job sites. I worked less than a year for a publicly-held publishing company that is self-insured. In the past 12 years they’ve for the most part quietly “laid” off 1/3 third of their workforce after the board, encouraged by its chair, prior to the economic debacle of 2007, bought a company that put them $1 billion in debt. So how do you balance the books? By letting go higher paid, typically older legacy employees with substantial knowledge or who cost more to insure. An older coworker, who had prior health issues, was offered the job of a younger male employee (most likely at half the pay given the company’s past antics), but I believe chose a severance. The younger guy was given the boot. He has no idea why he was targeted, but suspects it was because of the cost to insure his family. I believe he was let go for the company to cover for having laid off myself and the older guy, both of whom were over 40. This company has a developed a terrible reputation as an employer, both in its layoff practices and how it spends money, with its board approving large bonuses for the chair and other members as it emerged from bankruptcy and refinanced its own self-inflicted debt. $1 million-plus in bonuses that year alone. When this company makes its quarterly reports to stockholders its chair talks about how the company’s businesses have great reputations in the communities they serve, which is not true. Nor do they have a good reputation with workers in that industry. Two years ago, the reviews for the company on job sites were not that great. Conversations about them on forums are even worse. Recently though, their reviews have vastly improved although employees treatment has not changed. I suspect those glowing reports are related not to employee recruitment, but reputation management for the board look better to its stockholder or potential stockholders. It’s ironic in an industry tasked with telling people the truth, that they are not truthful about themselves, nor are they following the best practices standards they require of employees who provide the substance to the products they sell. Are companies using these employment websites to market their businesses as great places to work or as reputation management for shareholders? Is their purpose to give themselves 5 stars to improve stock prices? Is this legal for publicly-held companies to do? Lying and cheating have become strategies for doing business. The techniques are touted, praised, promoted, sold and paid for. Entire jobs are created to lie and cheat to make a business more “successful.” There are now “consultants” that will teach your company how to lie and cheat with class and with “plausible deniability.” That’s a new industry itself. Rationalizing and pretending lies and cheating are not really lies and cheating but “business” are now business skills that are cultivated, admired and hired. Our economy has become inured to it. It’s gotten to the point where such scofflaws get away with so much lying and cheating that honest businesses decide that to compete they must lie and cheat, or they’ll lose market share. I say NO. You have to decide what you will say. Compliments on the recent Glassdoor article…another example of the experienced insight, wisdom, research…overall common sense that is routinely provided The Ask Headhunter following. You are spot on, have such a firm grasp of the unfortunate games being played within the search/recruiting/human responsible spaces in business today. Many are out of touch, less skilled, experienced, lazy, often ‘pressing the easy button’, don’t care or just incorrectly undervaluing the impact of the #1 Resource of any business-organization…its Human Resource. Five years ago I was running a small company with 10 employees. We interviewed someone for a sales position and she turned out to be a crazy person; scary bad. She wrote a psycho review about us on Glassdoor, our only review. At a meeting, I asked our tight-knit team (50% millennial) what we should do. Should they write reviews to counter that? Do we respond somehow? Everyone agreed: meh. It was such a bad review it didn’t seem real and we did nothing about it – that review remained there in its stinky glory. I share this because, as an employer, not only did I not feel it represented us, neither did anyone on the team (great morale, high retention, still love all of them!). We weren’t growing fast, so recruiting wasn’t a problem. But finding great people *is* a problem for many companies, Glassdoor *is* a massive resource for many job seekers. I completely disagree with being able to take down bad reviews (even my stinky one), but it’s also true that most people won’t write a review without prompting unless they are pissed. When I travel, I receive requests from hotels to review them on TripAdvisor and when I receive great service I do it, because I know those are important for them. I wouldn’t even think to do it without the prompt. BUT – I had spectacularly bad service at a restaurant last year and I immediately went to give them a bad review without any prompting because it felt like my only recourse. In summary, I don’t love Glassdoor, but it’s a reality that employers have to deal with. So… I’d love to hear some practical, more genuine ways that employers can leverage Glassdoor. Not all of us employers are evil! Annete, all of these sites allow you to post a response to these bad reviews. An employer who has acknowledged the problem and stated how they will resolve it is a good one. Maybe in your case it’s just sorry you felt that way/we disagree. Glassdoor is now doing radio ads, just like ziprecruiter does. They’re targeting employers to post there jobs on Glassdoor. Unbelieveable.